Selena Gomez celebrated her 26th birthday by beating a record previously held by Beyonce. On Monday evening, Selena posted a gallery of photos from her Italian-themed yacht birthday party. The post -- which begins with a close-up of a smiling SelGo decked out in a pink, off-the-shoulder dress -- beat Beyonce's record for being the fastest user to get 1 million likes on an Instagram photo. Selena accomplished the feat within 13 minutes. 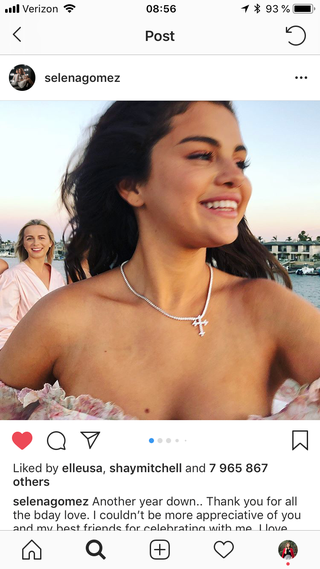 As of now, Selena's post has earned 8.4 million likes, but that number is only growing. Bey previously held the record with her pregnancy announcement and twin reveal photos, both of which have received a staggering 116.5 million likes each since the superstar posted them. According to Billboard, Beyonce's twin reveal photo, which she shared a little over a year ago, obtained 7.8 million likes within 12 hours. Meanwhile, her pregnancy reveal earned 6.4 million likes in its first few hours. Selena also beat Beyonce on the Hopper HQ 2018 list for richest people on Instagram. According to the London-based software company that automatically plans and schedules Instagram posts, Selena can charge companies $800,000 per post to hawk their product. Beyonce can reportedly charge $700,000. Key factors in determining what influencers' Instagram feeds are worth include follower count, average engagement and posting frequency. The one person Selena did not beat, however, was Kylie Jenner. The reality star and makeup mogul landed at the top of the list, dethroning Selena, who was last year's reigning queen. Kylie can reportedly charge brands $1 million to promote their products.